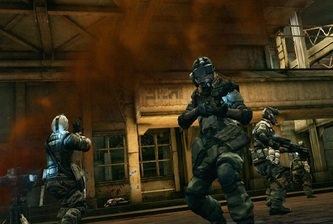 In 2005, a brief tech demo of Killzone 2 was enough to generate a wave of hype among gamers. Was this wondrous footage of actual gameplay or merely a clever marketing ploy designed to imitate it? The issue seems incidental now, but it’s easy to forget how powerful imagery can have a bearing on expectations. Four years of tantalising sound-bites and teasers later, the game finally launched, by which point the media had its knives well and truly sharpened, poised to decree the latest big thing a failure should they find the slightest chink in its armour. In the absence of anything concrete, many settled for Killzone 2 bearing the collective ills of the first-person shoot ‘em up genre and its most enduring weakness – a lack of originality. 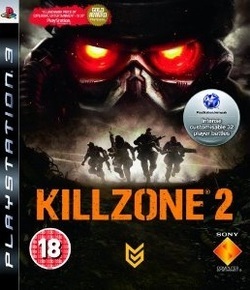 But marking Killzone 2 on the grounds of familiarity is somewhat akin to judging a car by the smell of its air-freshener. Here, originality is of secondary importance to the sheer quality of the experience itself. For what it’s worth, the game does in fact showcase a number of elements that explore the PS3’s hardware in ways other FPSs on the format have not, but it’s not new content that gives it the ‘wow’ factor; it’s stuff you’ll have seen before, just rarely this good. Certainly, it doesn’t rock the boat thematically, and from a purely objective standpoint, both its controls and sci-fi ‘n’ soldiers setting will seem well-worn to the more dedicated of FPS fan. But if the PS2 original was technically accomplished, its sequel is technically outstanding. That K2 should sport such a shallow, clichéd story lead by a shouty cast of could-be-anyone soldiers seems almost contradictory to it harbouring one of the most intense, enjoyable and intelligent gameplay experiences around, and yet that’s exactly what you’re getting. 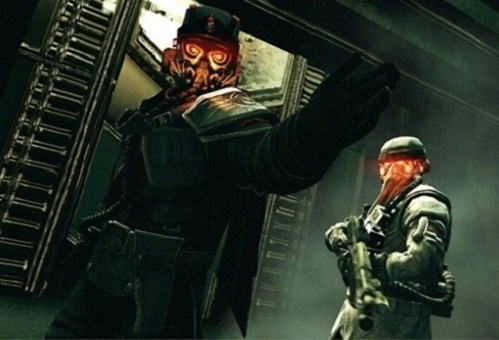 The game follows ‘Mr Generic’ Sev, part of the human ISA invasion force tasked with overthrowing the Helghast’s (powerful, gas-mask adorned hominids) home planet, with a view to capturing their defiant leader Scolar Visari and his sadistic henchman Colonel Radec. The combat doesn’t do anything exceptional within itself, but the strength of the game’s architecture and the rock-solid design means every inch of Killzone 2 is quality. 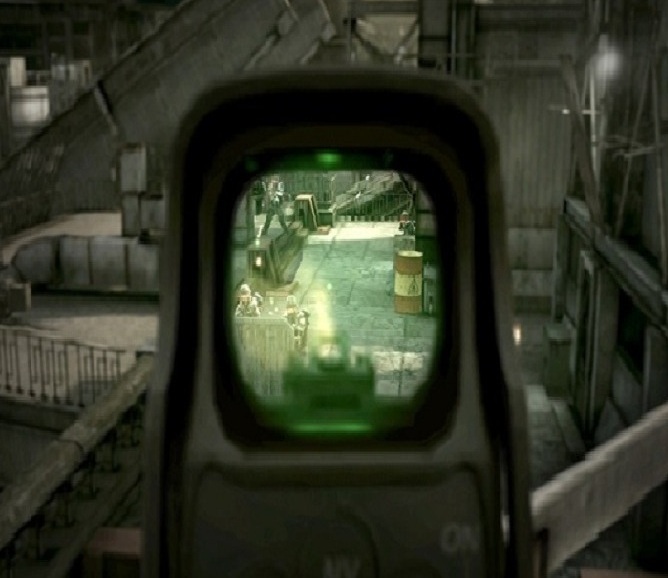 The weight of the controls takes a little getting used to; turning in particular feels heavier than in many of its contemporaries, though Guerilla accurately gauged the divide between testing the player’s quick-thinking and gradually challenging them to develop precision aiming in pressure situations. The guns don’t strike as imaginative a balance of human/alien technology as in the first game, though nevertheless feel like they’re meting out some real damage. They don’t feel lightweight in the way many FPS arsenals do, and the collision physics are completely immaculate even from considerable distance. Between the juddering use of the DualShock’s vibration function and the visceral, war film style puffs of blood that linger briefly in the air after you land a hit, it’s very satisfying. Visually it’s nothing short of a masterpiece; gorgeous to look at and flawless in its continuity. The brutal beauty of Helghan cannot be understated, even if the finer qualities have sometimes been overlooked amongst sentiment that the game’s muted green, murky veneer is derivative. 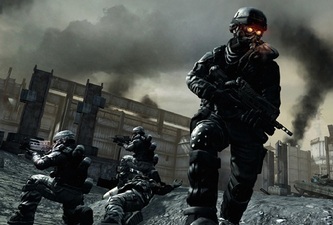 But make no mistake; Killzone 2 has one of the most remarkable graphics engines of its era, enough on its own to lift an accomplished FPS to a level of excellence, and in doing so delivers a level of overall immersion unrivalled on the PS3. It’s a number of technical triumphs, both big and small, that help create such a remarkable, tangible atmosphere. More than just the explosions, it’s the sum total of everything that happens in the environment 360 degrees around the player. The use of light and shadow is brilliantly foreboding, wind and rain effects have never been so convincing in how they affect surroundings, whilst the cut-scenes and depth of field, as you spy other battles taking place in the distance, are of a simply jaw-dropping quality. Every section of every level looks stunning, whilst allies and foes alike are supremely animated. The iconic Helghast still emit that haunting red glow from their eyes, visible as terrible streaks through the incredible, gritty swirling dust effects. And there’s reason to be apprehensive; they’re some of the best A.I. in gaming. You’re usually outnumbered and made to feel like it. Regardless of difficulty setting, enemy soldiers have got plenty of sneaky tactics up their sleeves. The bare minimum you can expect is for them to be finding effective cover and taking pot shots, but the Helghast are smart enough to make their numbers count. As well as trying to remain on the move, in many instances they seek to distract and surround the player. They’ll lob grenades to draw ISA troops out into the open, attempt to batter you at close range, and if things look to be going against them, they’ll regroup in classic, safety-in-numbers fashion. The two lowest difficulty settings present a good, durable challenge, whilst the highest make progression through each bloodied checkpoint seem like an achievement in itself. Cleverer than the average action-FPS but more accessible than the tactical shooters, K2 represents the best of both worlds. Though story progression is linear, there are many instances where a bit of thought will garner greater reward than rushing into a fight. Equally though, the shooting retains an element of instinctiveness, and there’s no faffing around with menus or team-orders. It’s relentless and rarely pauses for breath, though never loses anything for sticking to its guns. Unusually, Guerrilla opted to make use of the six-axis motion control; occasionally requiring you to twist the pad to open a valve or plant an explosive, whilst the Sniper Rifle’s scoped-aiming also reacts to physically moving the pad. Nothing special, but nice touches that add up. It’s replete with standout moments that will have shooting fans drooling at the mouth. The unforgettable opening sees you flying in towards the hellish, muddy Corinth River warzone, in what feels like a sci-fi ode to the D-Day landings. Bullets and missiles scream past the stricken carrier, as you’re powerless to help comrades being blown out the sky around you. In the closing stretch the ISA reach the final Helghast stronghold, but standing in their way is what feels like an entire army. Inching along trenches, finding an adequate enough stretch to cover you from the hails of bullets and occasionally returning a few of your own, sensing victory is agonisingly close, the utter white-knuckle intensity of the battle is remarkable. Even the relatively few quiet moments are carried off with aplomb; in particular, ghosting around the remnants of a deserted outpost, which feels unsettling after all that had gone before. In an age where the Call of Duty’s and Battlefield’s of this world tend to marginalise the one-player experience, it’s gratifying to see a big-hitter delivering such a full-blooded experience, and one you’re sure to want to play through more than once. The online multiplayer is absolutely stonking too. Pitching all matches as team affairs between the ISA and Helghast, you are free to jump into games and sample a range of different team games which are on rotation, thus meaning matches neatly avoid stagnation. There’s your straight-up, kill the enemy free-for-all; assassinations whereby you either have to kill or defend a particular target for a given time (very difficult in populated matches); as well as capture-and-hold marked territories and planting/defusing bombs. There’s a mountain of enhancements to be found simply because good performances ultimately translate into new abilities or points bonuses for certain soldier types. A healer for example can to begin with resurrect downed allies, but later on they can produce health-packs too. You can strategically place gun-turrets, or spawn-points to help teammates crowd an enemy base, and if you prefer to be sneaky, you can masquerade as an enemy in order to infiltrate them or even use cloaking. The odd level does leave you with the impression that you’re doing more running than fighting even with a 32 player field, but a majority of the eight maps are superb. What could have been better? The narrative itself has some potential, but its hackneyed articulation leaves a lot to be desired. Whilst the vicious Colonel Radec is proper villain material, the goodies are a bunch of meat-heads. When they’re not reeling off expletives, they’re making some tired, humourless jokes about ‘your mom’; it’s no coincidence the game isn’t viewed as high-art. The voicing as a by-product is lame, though the music saves face somewhat with a succession of rousing military-themed epics. The vehicle bits are oddly unnecessary, whilst the massive gulf between the sly Helghast adversaries and your moronic, seemingly-suicidal teammates is also rather vexing. This becomes more of a pain on the harder skill settings, as they are little more than a hindrance by then. 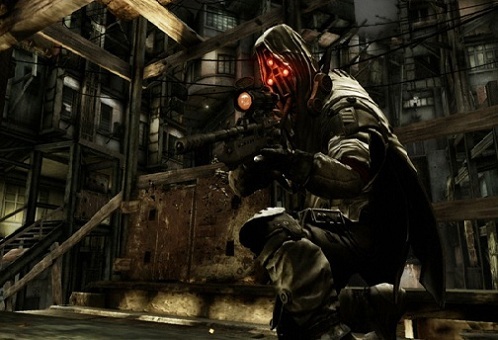 Still, Killzone 2 is the sum of its impressive parts. Dazzling graphics are backed up by a flawless game engine and a host of grand, show-stopping action sequences that are as immersive and involving as any game available. The one-player has scope for weeks of play, the multiplayer even longer and for all the time that’s passed, it remains part of a select group of games that feel as though they have got the absolute maximum out of the PlayStation 3 hardware. "marking Killzone 2 on the grounds of familiarity is somewhat akin to judging a car by the smell of its air-freshener. Here, originality is of secondary importance to the sheer quality of the experience itself..."